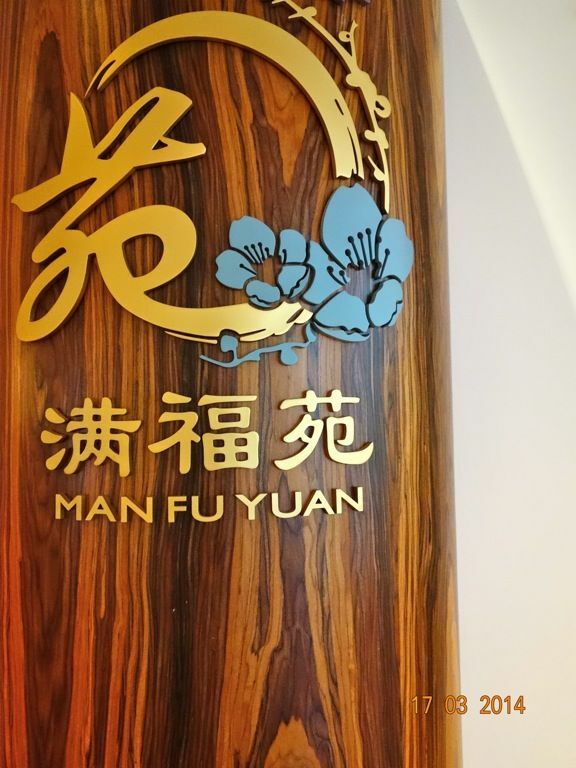 Man Fu Yuan is one of Singapore’s finest Chinese restaurants, serving classic Cantonese cuisine created especially for the restaurant by a Hong Kong Master Chef. 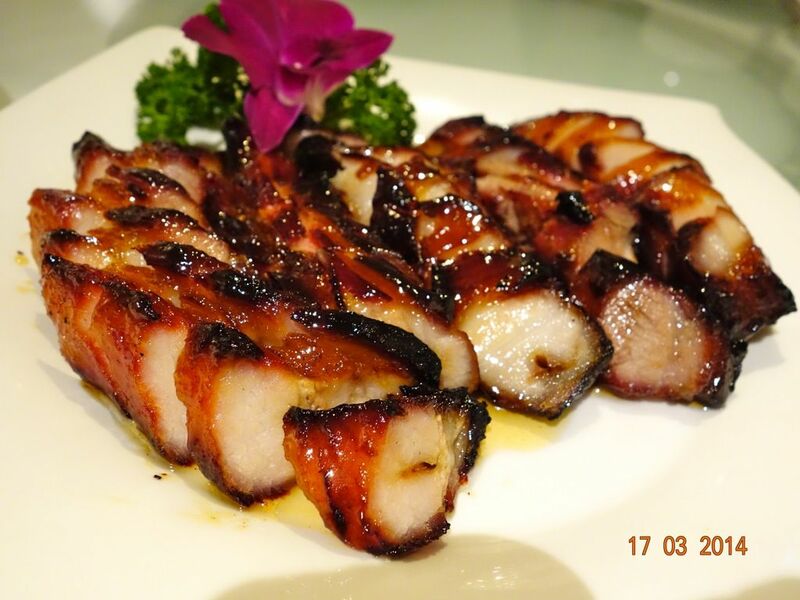 From now till 31 May 2014, Man Fu Yuan is serving some glorious dishes from the good old days, made using good quality ingredients and special and laborious techniques. Now here are some favorites from the Nostalgic Menu. This is the dish that had @thehungrycow devour 2 bowls of rice with it and also people going back for seconds and thirds (me included). 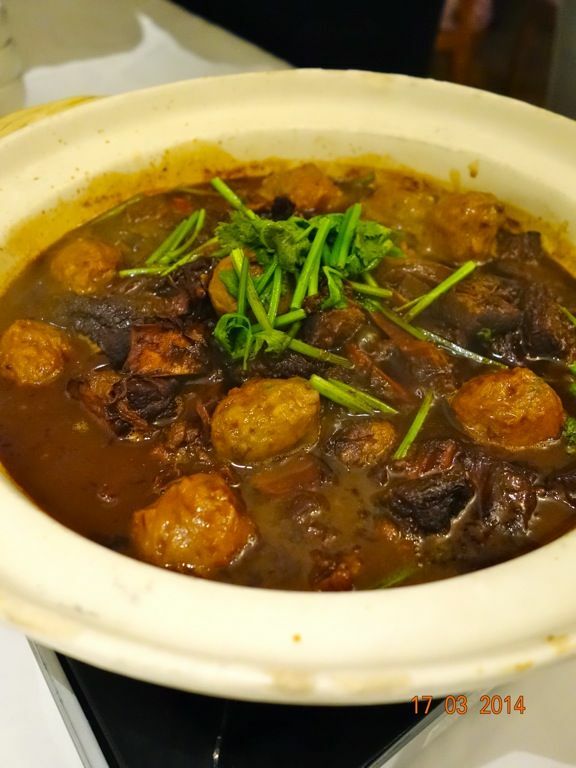 The flavourful Mixed Beef Stew with handmade beef balls 牛什牛丸煲 ($28 per portion). I love how the meat is tender and savory. The beef balls were succulent and had nice chunks of water chestnut in them. This is the perfect comfort food. As a nod to Man Fu Yuan’s tea-infused menu and focus on premium tea selection, chef’s new creation Tea-smoked Pork Belly Char Siew 脆皮叉烧 ($24 per portion) takes centre stage, featuring pork belly marinated in a combination of Chinese rose wine and barbecue sauce. 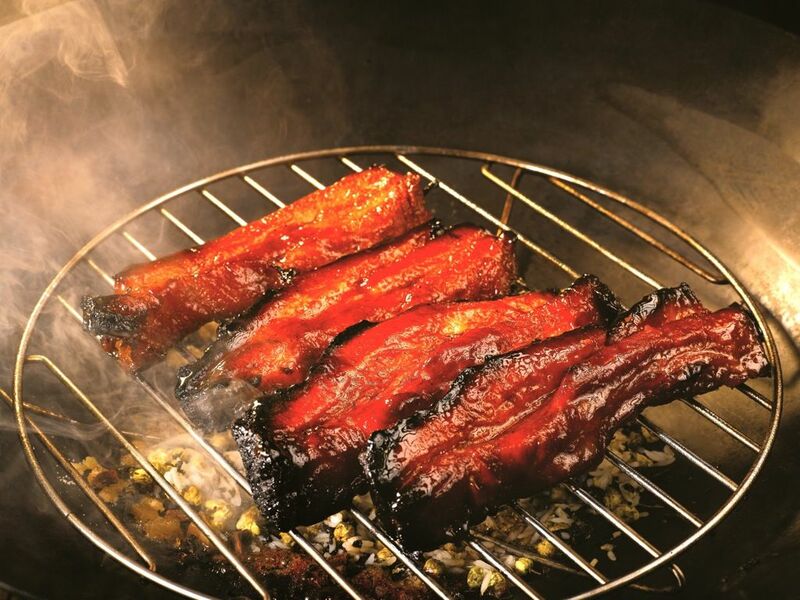 Combining Cantonese roasting methods with Szechuan technique of smoking the char siew, this results in a deeply flavourful and succulent meat with the smoky aroma of Royal Red Robe tea, finished off with a maltose glaze. It's fatty and decadent but hey YOLO. 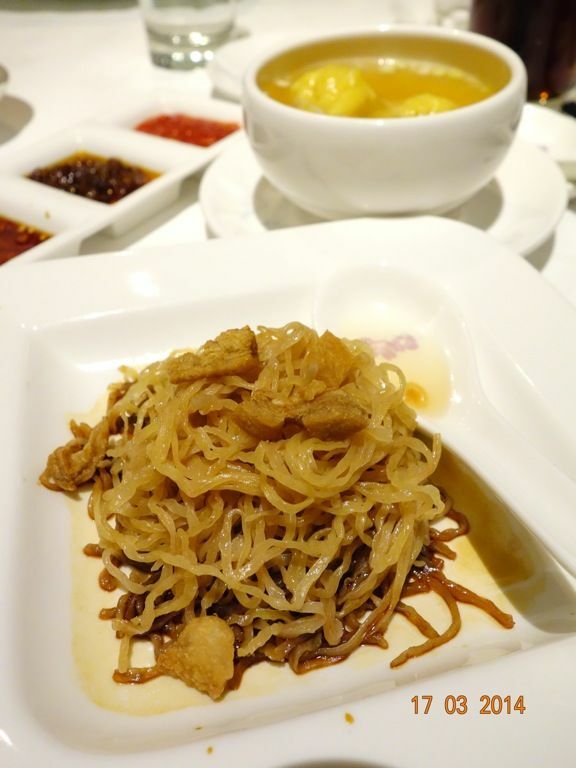 The char siew goes perfectly with the crunchy duck-egg noodles 猪油渣捞全蛋面 ($6 per person) served with first-press soy sauce and topped with crisp-fried lard. Yes you heard me. There were a lot of fried lard in this meal and is certainly not for the health conscious. I avoided the lard but i have to admit that it does add depth to the flavor of the dish. I loved the Hong Kong Style Steamed Pork Belly in Shrimp Paste 港式咸虾酱蒸花肉 ($28 per portion). This is another comfort dish and i can fully identify with the flavors though i've never had this dish before. 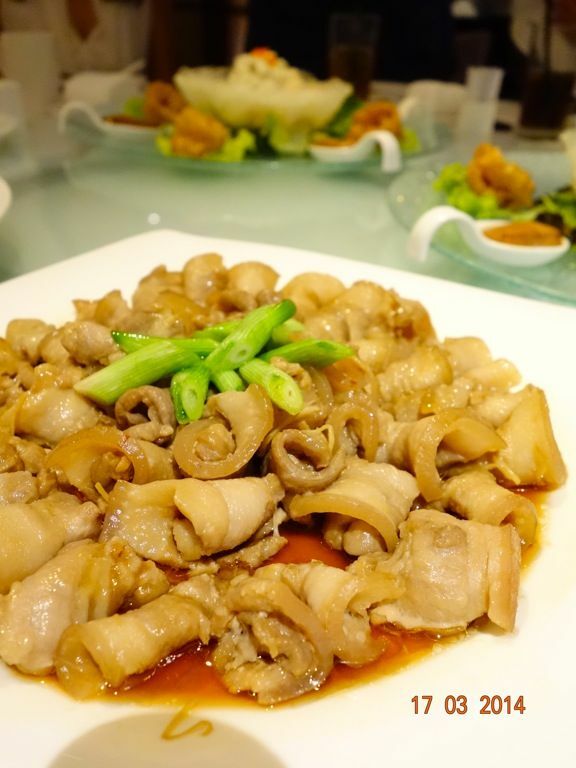 A simple dish of “Hong Kong” style pork belly is elevated to delicious new heights as it is slathered in fermented shrimp paste from Tai-O in Hong Kong, home to high quality shrimp pastes and then steamed to perfection. Salty, stinky and oh damn delicious. Give me another 2 bowls of rice. 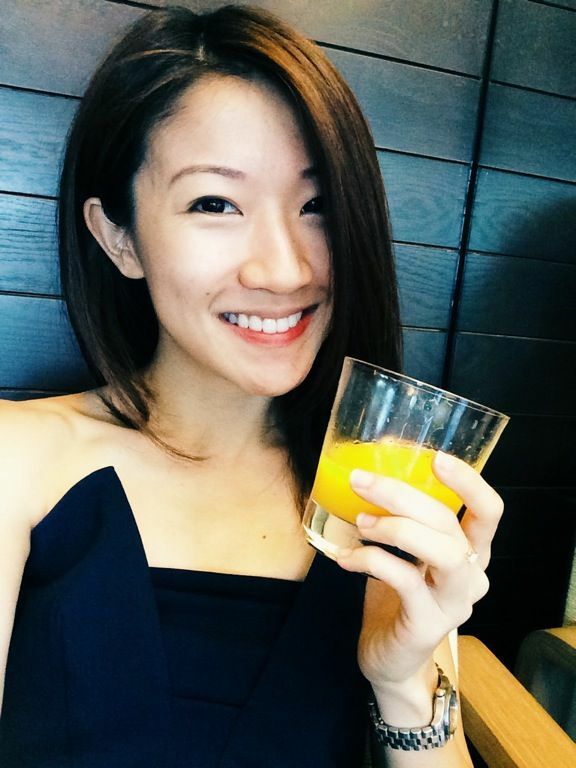 Nostalgic flavors are really all about familiar and heartwarming home cooked flavors. I loved the Steamed Chicken with Chinese Sausage and Mushroom 风流天子(腊肠香菇蒸鸡球) ($26 per portion) with the soy gravy that has absorbed all the sweetness of the lup cheong and smokiness of the mushrooms. The meat was also really tender. Other menu highlights include the following. Pig Trotters with Vinegar 猪脚醋 ($28 per portion). The meat was well braised in plum vinegar and you can smell the sour perfume from far. The dish is on the oily side though. 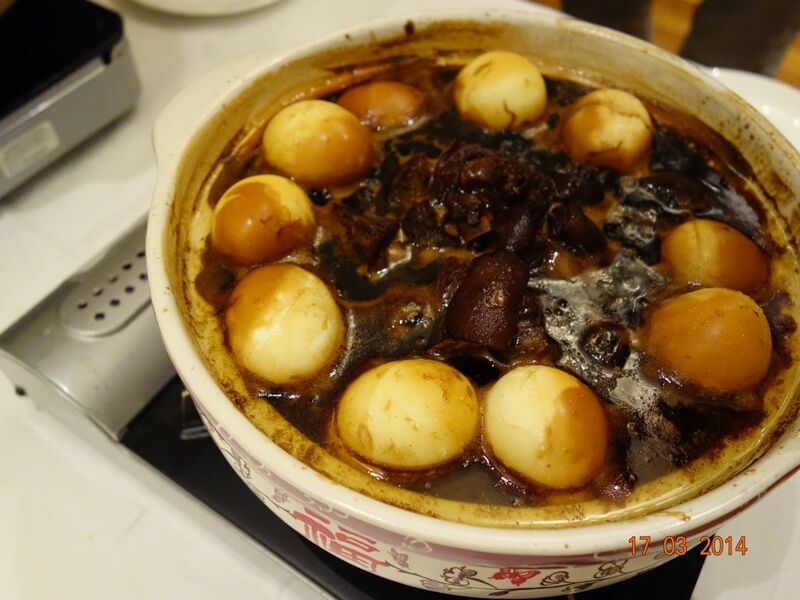 Steamed Fish Head in Black Bean Sauce 豉汁蒸鱼头 ($28 per piece), studded generously with morsels of lard. The Six Treasures Seafood 龙王夜宴 ($88 per portion) a ‘60s banquet classic. The seafood in the basket was mostly bland but I enjoyed the salted egg yolk prawns which had a fluffy and crispy egg skin. 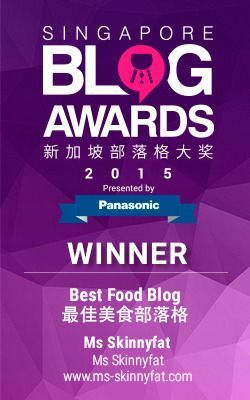 As with any decent Cantonese meal, there needs to be a good double-boiled soup. 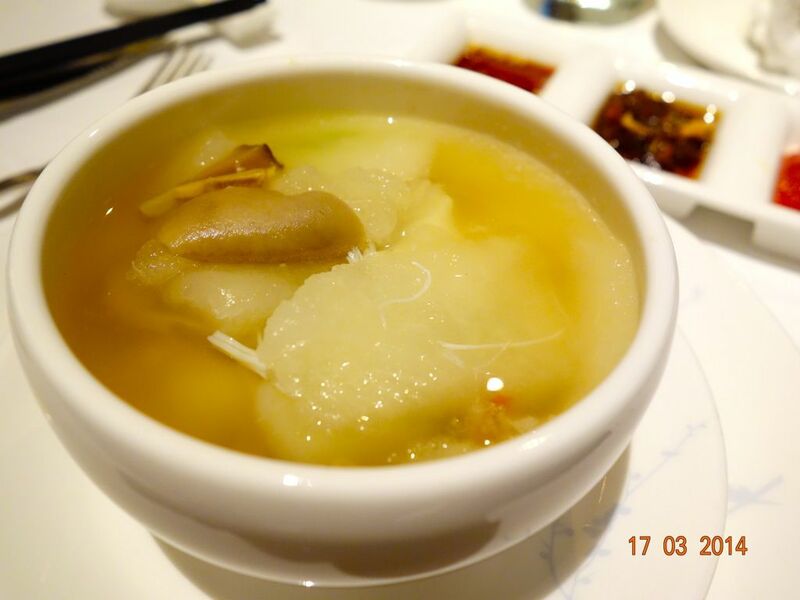 We had the Winter Melon with Seafood Soup 原只东瓜炖海中宝 ($58 for 4 persons). It's light on the palate but still savory. 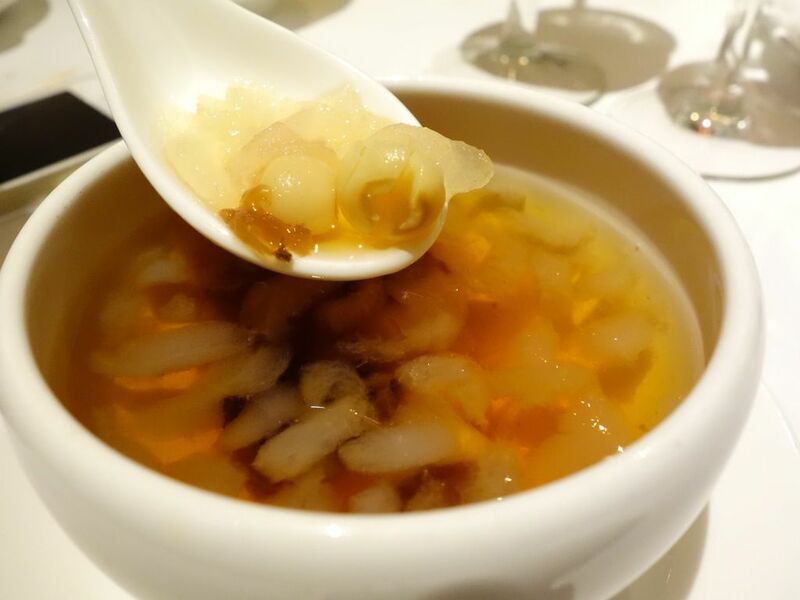 The soup comprises prawns, scallops, crab meat, conpoy and duck steamed and served in a whole winter melon. Ended dinner with some Hashima. It typically comes served in a coconut but Chef wasn't too pleased with the coconut that day. If you find these flavors familiar and are craving for it now, Man Fu Yuan's A Taste of Nostalgia Menu will be available as part of a rotating a la carte menu available daily till 31 May 2014. Do call the restaurant to find out if they'll be serving your favorite dish before heading down!